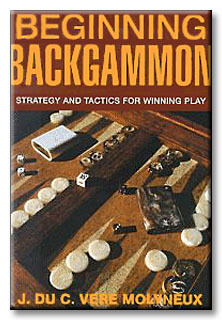 COVER: This book is for the complete beginner at backgammon. In simple language, and illustrated with plenty of diagrams, it introduces this exciting, popular game at all its levels. Whether you are looking for a pleasant family pastime or a competitive gampling game, backgammon can supply the answer. The combination of skill and luck that is at its heart enables players of differing skill and aptitude to play together without boredom or one-sided results. Covering the rules of the game, elementary tactics and overall strategy (including dice probabilities and gambling aspects such as the right use of the doubling cube), sample games are used to show the theory in practice. Alternative games that can be played on the backgammon board are also included.